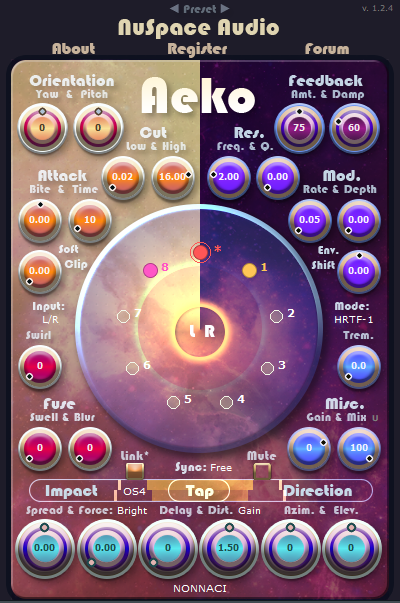 Aeko is a Dub/Delay/Reverb plugin (VST/AU) that integrates a multi-effect feedback delay-line architecture with a 3D binaural far/near field panner. Motivated by the human ear’s abilities to separate sound-sources beyond traditional 2D stereo fields, Aeko turns simple samples and short loops into rich sequences arranged in both the 3D acoustic field and time. 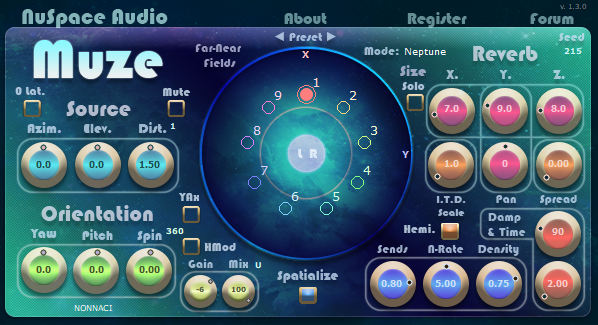 Eight fully customizable feedback delay-lines drive the source signal into separate point-sources placeable on an interactive spherical sound-stage, supporting both Head-related Transfer Function (HRTF) models and panning modes, interaural delay-free/neutral/elongated variants, and point-source spread/force controls. Equalizers: High/low cut, resonator, and dampening filters produce lo-fi to reverb-like decay effects. Modulation Morph: Delay-line modulation produces frequency-echo effects morphable into a 12 semi-tone pitch-shifter. Transient Processor: Adjustable envelope follower culls attack and release signal components, turning loops into quick snaps and smooth waves. Soft Clipper: Over-driven feedback gain produce distortion buildup effects with a hardness adjustable clipper. Fuser: Two stage component adds reflections to create swell and blur effects. 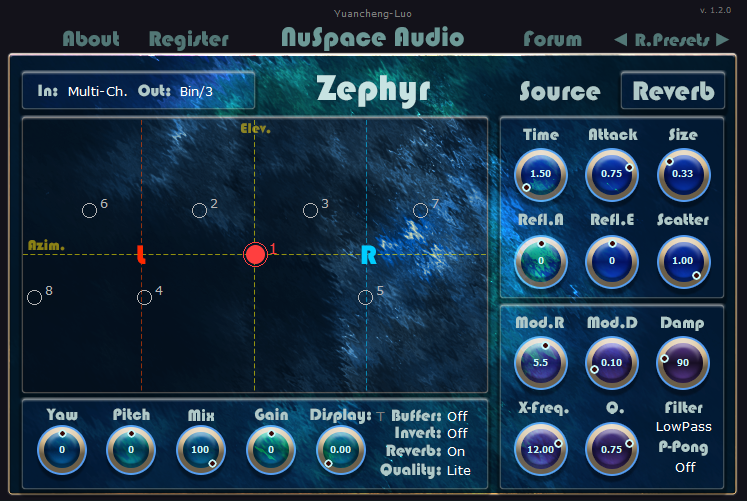 Reverb Morph: Independent feedback delay-lines can be cross-mixed / swirled into creating reverb and shimmer effects. Overdrive: 10 distortion functions to choose from. Post-Filters: Low/High pass, resonant, 3-octave, and tilt variants. Tempo-Sync: Freely adjustable delay-line lengths can be synced with quarter, dotted, and triplet notes / DAW’s BPM. Parameter Linking: Delay-line effect processors can be linked to shared parameters or unlinked for independent modification. 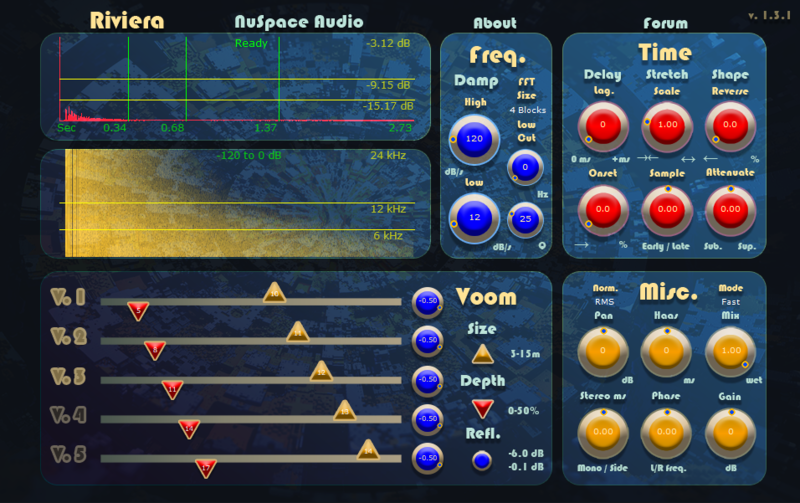 Spherical Sound Stage: Interactive GUI places/moves/toggles delay-line point-sources. 3D Panner Modes: Supports far/near field HRTF based models at all sampling rates and panning mode for loudspeaker setups. Visit our storefront for pricing info on all our products. To directly order, click below! Just click on the original download link from the Fastspring email. It should contain the newest version of the plugin. Do I replace the old file (paste it) & do I have to license it again ? Replace will do. You do not need to re-register.